A loan of $1,800 helped raise enough capital to complete the first batch of products. I am a southern gal born and raised on Florida's coast, shaped as a product designer in Atlanta, trained as an artist in Chicago and serving as a maker and textile designer in Detroit with a heart for historic preservation in the city. I am also owner and designer of Scarlet Crane Creations, which reflect much of the built spaces and ideas that matter in our everyday lives with home goods and accessories that include hand-lettering, modern illustrations and pattern design. Since moving to the Detroit area, I have fallen in love with its architectural gems, and having studied architecture and working in the field of Industrial Design, I appreciate the city’s historic landmarks. Much of my work reflects this. One of the most popular items sold in my retail store is a tea towel featuring my “Detroit Landmarks” illustration as a 2-color screen print. This led me to seek out ways to expand the line into products that could be elegantly integrated into any lifestyle. It will increase production of these handmade accessories highlighting Detroit's beauty. 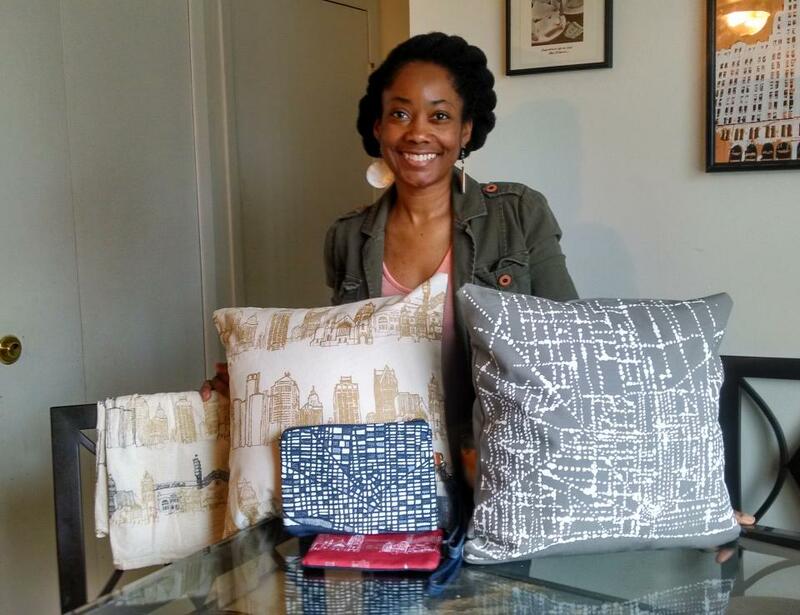 People with a passion for high quality, handmade accessories who feel strongly about Detroit’s historic buildings come to Scarlet Crane Creations. We’ve created a gorgeous series of fashion accessories and decor perfect for those looking to join the preservation cause AND show their love for this great city and its most prized gems in both architecture and community. Architecture is an important part of any urban landscape and continues to be a means to share the history and culture of a community and draw in people from all walks and backgrounds. Detroit is home to some of the finest architecture in the U.S., and many of Detroit's skyscrapers and buildings are some of America's most endangered landmarks. These gems along with the communities that make up the great city of Detroit continue to inspire us, so we created a line to reflect that. More than Detroit Swag: Our well-crafted products feature surface designs and patterns that are bold, vibrant and elegant. They are a collection of tea towels, pillows, posters, and wristlets that are inspired by Detroit’s landscape & most prized architectural gems. Most importantly, a percentage of proceeds will go towards organizations that help preserve these structures and work to enhance the lives of those in surrounding communities like Preservation Detroit which serves to protect Detroit’s built environment and CDC which provides education, employment and economic development for the Detroit community. When you purchase one of our thoughtful, well-made pieces, 20% of the proceeds supports Detroit preservation & community development. You could help fund the work to turn an old, abandoned structure into an affordable home or you could help educate the public about an important architectural treasure in Detroit. We have started production on the first batch, but need your help to finish and get our products to a large number of retail outlets because the more we sell, the more money we can donate to preserve Detroit’s beautifully built environment. Here are the steps we'd like to take: 1) We raise enough to complete the first batch of products 2) We bring the products to you or a local boutique. 3) Profits go toward preserving Detroit’s buildings and communities 4) We all help grow Detroit and share our love for this great city and it’s residents. Stylish and made to last: Our products aren’t mass-fabricated home goods and accessories. They are screen printed on natural fabrics with care by Scarlet Crane Creations and assembled by the fabulous Detroit-based, cut & sew operation, William + Bonnie. Both companies are proud members of the local maker community and partner with many artists and designers around the city of Detroit to produce work that has been featured on WWJ radio & Crain’s Detroit. This loan will be used to purchase fabric, ink and hardware to produce 50 pcs of each of the 4 products (tea towels, pillows, wristlets & scarves) within the Detroit Collection. This first batch of goods will allow us to make our products available to local boutiques and lovers of Detroit. We aim to inspire people and their surroundings with high-quality goods for fashion and home decor. We’re all about preserving this great city along with it’s beautiful built structures with 20% of proceeds going toward preservation and community development. That makes us all smile. Why are you endorsing Shayla? Shayla is not only my Mind Your Art Business course Graduate but also a personal client so I'm VERY confident when I say that she has ALL of the qualities of a successful business owner; innovation, intelligence, the quest for knowledge, great communication and relationships skills, care for quality, philanthropy and a strong work ethic. Not only that, but she's manufacturing her products using another of my clients, William & Bonnie so I KNOW that together, the pieces will be crafted with care for a discerning consumer. In addition, I will be continuing to guide Shayla/Scarlet Crane Creations to prepare her for imminent growth and any obstacles that may arise (and there always are challenges when building a creative business). I am 100% confident in Shayla's ability to sell her product, pay back this loan in a timely manner, support Detroit and its historic locations and offer wonderful customer care.